Today I got a delivery from the nice folks at FreeTalk.me. They are the dudes that make the Skype ATA box call FreeTalk Connect Me. ATA you ask? Yes, ATA, its phone-speak for Analogue Terminal Adapter. Remember in the old days when you used to have a phone and it plugged into a phone line. You picked up the receiver and THEN started dialing. I can only just remember it too, but what this tricky box does is allow you to plug your old phone into the ATA and then the ATA plugs into your phone line. The cunning bit is that it ‘also’ plugs into your broadband connection. You can then make International/Long Distance calls using Skype’s low cost call rates. You can see them here on the skype store: http://www.skype.com/intl/en-us/get-skype/home-phone/phone-adapter/ they cost ‘from’ USD 39.99. I’m currently in New Zealand (I normally live in England) but had the unit shipped here. I got them to send me a UK version so I can take it back to England with me when I head back home after my holiday. I ordered the unit on the 9th of January 2012 and it arrived on the 19th of Jan 2012. Ten days from order to delivery internationally. The package seems to have come from Barcelona, Spain, then to China, Hong Kong, Auckland (New Zealand) via UPS. UPS then sent it to a company called Flyway Couriers. That got it as far as Napier. Napier is a 20 minute drive from my house. It got there about five days ago. So I guess if I was living in Napier I would have got it around the 14th instead of the 19th. At the Napier end UPS said, delivered on their track and trace system and that some strange number had signed for it. I sighed and though, oh no, not going to see my international delivery ever again. I contacted the FreeTalk people via http://freetalk.me/contact/ which is a stock standard form. I got a response same day from a lovely girl called Sue. She said to call up the local UPS branch and ask what had happened. I did and was told that it had been shipped to another company called Peter Baker Transport, who handled deliveries that were ‘out-of-town’. I would like to note at this point that where I am staying, is 3 miles south of the center of town. But I guess, since there are no other houses around me, I’m in the ‘country’. So, I rang up Peter Baker Transport and was informed that it had been shipped to ANOTHER organisation the ‘rural delivery’ van and that it should arrive tomorrow. So, today, is, tomorrow. And sure enough, the package arrived at my door. It’s tiny, and EXTREMELY eco-friendly. I liked the packaging so much, I have taken a few photos of the opening process. The first thing you should note is how small the packing is. It’s brown recycled cardboard, yet its extremely sturdy. I had a quick attempt at crushing it after I had taken the stuff out, its surprisingly strong. Next, it has soy based inks.. fully recyclable and good for the environment. There is a minimum of writing on the outside of the box and some small artwork on the inside of the box. I have one small complaint. The rip-here tab wouldn’t rip. It’s quite tough, and I ended up taking off the glued in bit. Not a biggie, but just something that wasn’t quite flawless. Once you have the package open you are faced with the little red warning piece of paper. They REALLY want you to put the cables in the right holes, I guess you can damage the electronics if you get it wrong… I didn’t bother experimenting… I want this thing to work. You are given one landline cable with the little mimi-jacks on each end and an ethernet cable (blue). Under these cables were two packages, one was the ATA unit itself and the other was the power adapter for it. I pulled them both out and slipped the power adapter into the ATA unit. A small click and it was done. I didn’t have to use much force at all. Next thing I did was unplug the phone from the wall and plug it into the ATA box. You can’t go wrong here, its got an icon of a phone. I then used the supplied cable to connect to the wall socket. Ethernet cable plugs into the blue (LAN) socket and the other end into my WiFi Internet router. I then plugged it in. I then opened up the instructions for what I though might be the tricky part and skipped to the end. I have a Mac so I fired up the Mac Web Browser called Safari. 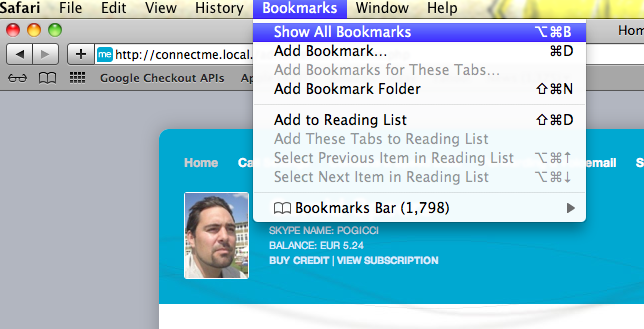 I then went to the show all bookmarks as shown in this image. The next bit was easy, although it took about 20 seconds for the Freetalk ATA to respond. So click once on the Freetalk setup link and then wait. You stat by clicking on the Bonjour link on the left. It then goes and finds the Freetalk Box and puts the link in the bottom window. Click it once and wait. It will come up with some simple to do setup things. The next few setup pages were very simple. It asked you for your area code (probably for the emergency dialing stuff), I put in 0208 as my prefix – which is for where I live in London, England. I then proceeded to type in my skype handle and password. It all worked as it was supposed to. Once you complete the setup (some of the screens take a few seconds to come back when you hit continue/save) you can pick up your phone and hit *0 (that’s star zero) and it will call the skype test number. If you have set it up ok then you will hear the voice of the skype system saying: “Welcome to Skype call testing service”. You can say something, then stay silent and it will play it back to you so you can hear the quality of the call. So far I’m giving it a 10/10 as a product. It does what it is supposed to and the installation was simple. However, I should also give a disclaimer, I am friends with the guy that owns the company and he sent the product to me to do a review. However, that aside, it was exactly what I was expecting. AND it works. This entry was posted in Freetalk, Skype and tagged ata, freetalk, freetalk-1220, land line, skype, skype ATA. Bookmark the permalink. I am from Bangalore, India. I have a skype number(1 408 890 2017 from which I get calls from USA and make calls to USA. All I want to know is, can I make and get local calls in India. If you have a skype in number for india then yes you could. OR you could get a local indian phone line.. makes sense if you are already in india..